Etching, line engraving and aquatint on wove paper. 9”h x 13 ¾”w at neat line plus title and margins, uncolored. Minor discoloration at upper left corner, loss lower right corner expertly reinstated, not affecting image. Very good. 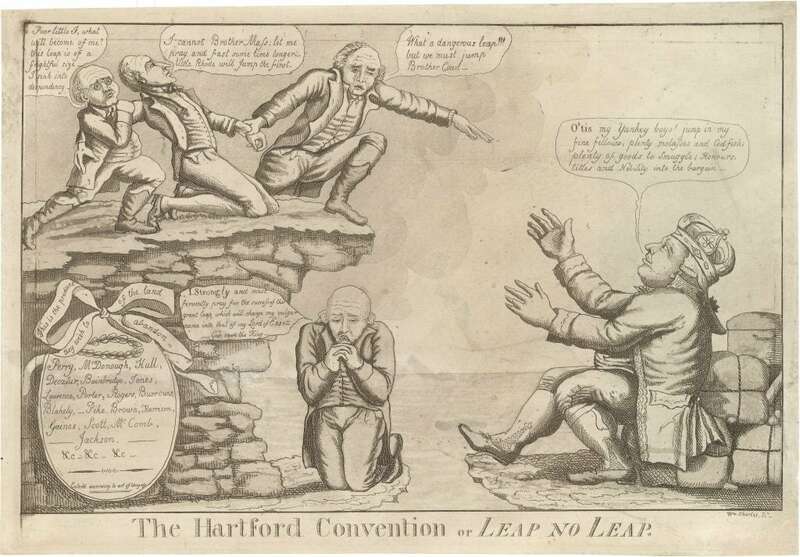 A scarce and striking political cartoon satirizing the 1814 Hartford Convention, at which delegates from New England states contemplated secession from the Union. Following the ratification of the Constitution and against the hopes of the Founders, American politics rapidly organized into a two-party system that approximately mirrored sectional differences: Roughly put, the Federalists emphasized global commerce, a strong central government and related institutions such as a National Bank to support this commerce, and alignment with Great Britain. Republicans emphasized the agrarian economy and states’ rights, and were sympathetic with the French Revolution. In the first decade of the 19th century relations with Great Britain were strained to the breaking point by repeated British violations of American sovereignty, in particular the impressment of its seamen and restrictions on its trade with continental Europe. To force Great Britain to give way, Republican President Jefferson rammed the 1807 Embargo Act through Congress. The intent of the Act—totally misguided, as things turned out—was to strangle Britain by denying her essentially all American trade. It failed in this regard, but did succeed in badly damaging the interests of New England’s largely-Federalist mercantile class. In June 1812 continued tensions with Great Britain provided the basis for an American declaration of War under Jefferson’s Republican successor James Madison. Ironically, while the putative objective was to defend American sovereignty and commercial interests vis-à-vis Great Britain, the commercial and Federalist North in general wanted nothing to do with it. The real backers were the “War Hawks” of the western states, led by Henry Clay, who saw war as an opportunity to clear the British from Lower Canada (Ontario) and open the region for American settlement. 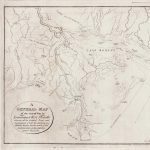 Northern resistance to the War was so strong that in 1814 representatives from the New England states met at Hartford to work out a concerted response to Madison’s war policies. The primary agitator for the so-called Hartford Convention was Massachusetts’ Timothy Pickering, who hoped it would result in either a call for drastic revision of the Constitution or outright secession by the New England states and a reunion with Great Britain. 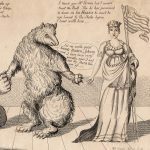 The actual outcome was far more limited, consisting of proposals for modest constitutional amendments and policies to enhance New England autonomy and protect its interests. All came to naught, however, as American victories and the Treaty of Ghent left President Madison and the Republicans firmly in control. Charles was an illustrator, engraver and publisher active in New York and Philadelphia in the first two decades of the 19th century. Born in Scotland, trained in England, and active early in his career in both Edinburgh and London, he probably arrived in New York in or after 1806. The Hartford Convention features the boldly-etched lines and strongly-modeled figures characteristic of his work. Library of Congress, American Political Prints, 1776-1876, #1814-2. Murrell, American Graphic Humor, #83. Stauffer, American Engravers, #333. As of November 2018 OCLC #191119914 and 62107505 record only an impressions at the American Antiquarian Society and two at the Library of Congress (one on wove and the other on laid paper). Weitenkampf, Political Caricature in the United States, p. 19 (recording copies at the Huntington, Historical Society of Pennsylvania, Library of Congress, Maryland Historical Society, New York Historical Society, and New York Public Library, as well as an example at the NYHS with additional figures and printed in reverse). 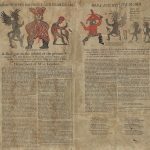 Another example held at the American Antiquarian Society.